The next day was a busy one where I was able to put the 20mm to rather more use. It was also a day with some very contrasty lighting with low sun and a fairly clear sky, which gave me some problems, both with the 20mm and the 18-105mm. 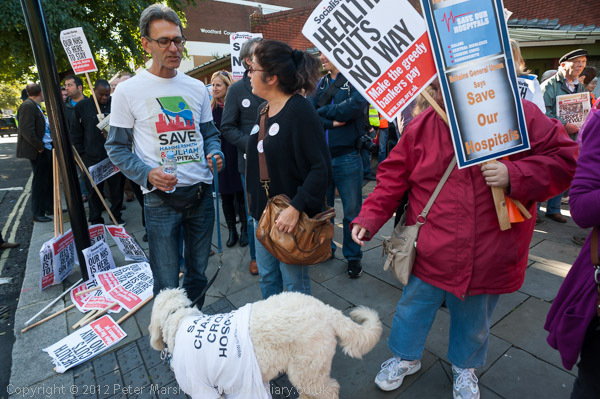 I started at Shepherd Bush, working in the small crowd waiting for the start of a protest against the downgrading of services at hospitals in West London. I was using the 20mm to work in close to groups of people and didn’t want to use flash to fill in the shadow areas. The smaller size of the 20mm compared to the large 16-35mm seemed to work better in this situation. From there I went to Whitehall, where a fairly new group, Britain First were protesting against the grooming and abuse of young girls by Muslim gangs and the failure of police and the authorities to take some of the complaints made by these girls seriously. 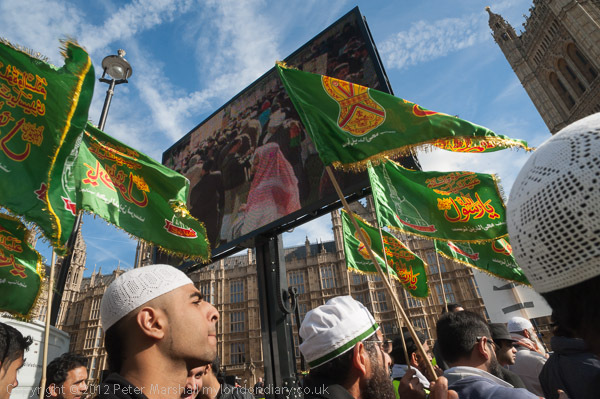 The 20mm worked pretty well here too, and it was only when they marched to Parliament Square and started to burn an Islamic flag that I found I had a problem. (The protesters also had a problem in that they had chosen a flag made from a material that didn’t burn at all well – eventually after it had smouldered a little they gave up an waved a shoe at it instead.) It isn’t obvious from the pictures, but I was hemmed in at left and right by other photographers as I took these pictures, and was unable to move further back (or closer) to the subject. For some of the pictures I really wanted a slightly wider view, and this would not have been a problem with the 16-35mm zoom. Again, although I had the 18-105mm DX, its 27mm equivalent widest view didn’t cover the range down to the 20mm. At times like this, when you are more or less stuck in one place, the zoom really comes into its own. 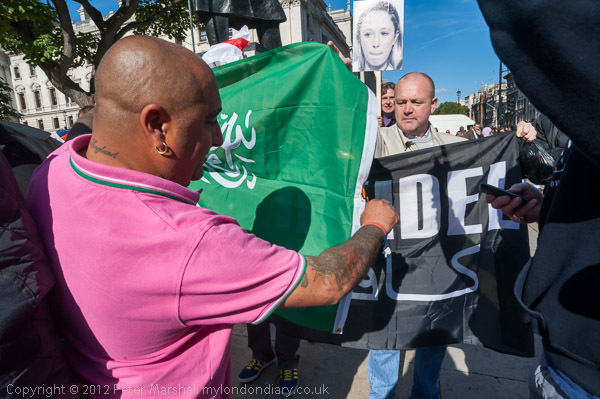 A couple of hundred yards down the road from the small group of Britain First was a large assembly of Muslims protesting about the internet video which has led to violent reactions around the Muslim world. Here there was certainly plenty of anger, but it was a peaceful event. Most of the time I needed a longer lens, but the more interesting pictures perhaps came when I went into the fairly densely packed crowd to photograph, mainly with the 20mm. Although I was fairly happy with what I managed, I did miss the slightly wider view of the 16-35mm, and again with the very restricted movement imposed by the crowd around me, the ability to zoom would certainly have helped. 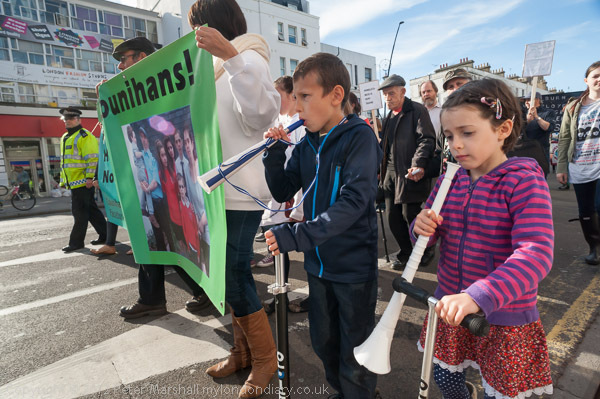 My final set of pictures came from a rally and march in Kilburn over the failure of Brent Council to deal fairly with a large family and their housing needs. Here there was plenty of room to work, and I really began to appreciate the advantages of a fixed 20mm lens. When you’ve had a couple of cameras around your neck most of the day, its light weight is also a great advantage, but there is a kind of discipline it imposes on you. One of the vital things about photography is that you need to be standing in the right place to make good pictures, and there is more definitively a right place with a fixed angle of view than with a zoom. This entry was posted on Sunday, November 4th, 2012 at 12:31 pm and is filed under My Own Work, Photo Issues, Political Issues. You can follow any responses to this entry through the RSS 2.0 feed. You can leave a response, or trackback from your own site.